Resurrection Dreams is 352 pages long and it’s a typical Richard Laymon horror novel. The characters are great. They seem very real and the whole book is so well written that even the unreal situations that they find themselves in seem perfectly believable to the reader—this reader anyway. The main character in the story is a girl called Vicky Chandler and the reader first makes her acquaintance in the second chapter. Vicky is still at school at that point and lives with her parents. Her best friend is a girl called Ace. Ace is tall for a girl and her personality is also . . . well . . . big. The odd-ball at school is a young man named Melvin Dobbs. Melvin is a strange kind of a guy. Example: when Ace throws a spitball at him, Melvin eats it. But that’s nothing compared to what Melvin does at the Science Fair—God no. Vicky’s project involves dissecting a rat. Aces’ project is a display of various moulds. But Melvin! Melvin likes to be different. His science project involves the corpse of a dead cheerleader, a car battery, and some jumper cables. To cut a long story short the dead cheerleader loses her head (again) and everyone else loses their lunch. And Melvin? Well, Melvin loses his freedom for a little while. When Vicky returns to Ellsworth City, some years later, she is a qualified Doctor. Ellsworth still feels like home to her, even though her parents have moved away, and she is glad to be back. The only problem is that Melvin is back too and, like a lot of people, Vicky still has bad dreams about the Magnificent Melvin’s Resurrection machine. What makes things worse for Vicky is that Melvin has got a major crush on her and Melvin is not—strange to say—her type. I love Resurrection Dreams. 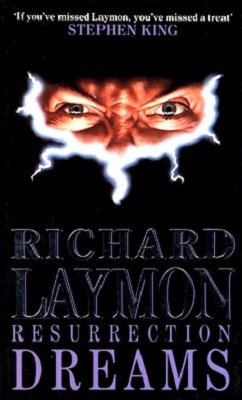 I have now read it twice and it is one of my favourite Laymon books. Be warned though, this is not a book for the squeamish. The story gets rather bloody and gory in places, but, if you are familiar with Laymon, there will be nothing that should surprise you too much and, as is often the case with Laymon, the unreal seems frighteningly real and . . . well . . . what can I say? You should read it.